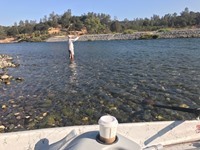 Drift Boat Trips We offer full-day drift boat trips on the Yuba River. Our clients have the option of fishing from the boat all day or getting out and wade fishing for part of the day. Excellent Wade Fishing The Yuba River has excellent wade fishing opportunities. Our guides frequently get our clients out of the boat to cast nymphs and dries to the Yuba's wild trout. Wild Fish Only The Yuba River is a wild trout fishery. It has a self-sustaining population of wild rainbows that are known for their hard-fighting nature and propensity for eating dry flies. Tailwater Trout Fishing The Lower Yuba River begins at the base of Englebright Dam. Being a tailwater fishery, the Yuba has fairly steady flows and temperatures throughout the year, making it a great habitat for aquatic insects and trout. Excellent Hatches The Yuba is known for excellent hatches and for trout that are tuned in to surface activity. Some of the best hatches include the skwala stonefly, march browns, PMDs, and summer terrestrials. Big Wild Rainbows Typical rainbows on the Yuba are in the 10-14" range. Most days offer chances at 18"+ fish, and there are plenty of 20"+ fish in the river. The Yuba River is one of California's premier wild trout fisheries. Being a tailwater stream, the regulated flow and temperature of the river make for excellent trout habitat year-round. The river has several well-known hatches, including the skwala stonefly, march brown mayfly, and summer grasshoppers. Yuba River trout are hard-fighting fish that are prized for their willingness to rise to a dry fly. This popular fly fishing destination is located just an hour from Sacramento and within 3 hours of the Bay Area. Mike Wright is our go-to guide on the Yuba River. He is one of just four guides that have private access just above the Highway 20 Bridge and also at Daguerre Dam. This private access makes possible a great full-day float of about 7 river miles. The section of river below the Highway 20 bridge is open year-round and excellent fishing can be had at any time of year. Every trip offers our guests numerous opportunities at quality wild rainbow trout. What a great day on the Yuba! Spent the day with Jeff from Sacramento chucking fat grasshoppers all day. We had a blast! We had a number of smaller fish come up and crush our fly with mixed results on hooking up as they seemed more poised for a fight than a meal. The real highlight, was the number of larger of fish that couldn't resist either. Got a few to the net with a few more heartbreaks. So fun to watch the grabs!!!! We picked up a few fish nymphing as well so it looks like a good time to get out on the Yuba even with the heat! Visit our Yuba River Fishing Report page to view more reports! Rods, Reels & Lines: Four, five, and six-weight nine-foot rods are ideal on Yuba River. We typically have two rods rigged at all times, one for deep nymphing and another for shallow nymphing and dry fly fishing. Five-weights are perfect for dry fly fishing. Five- and six-weight rods are great for nymphing. Leaders, Tippet & Indicators: We frequently use tippet from 2X to 5X on the Yuba River. Come prepared with 9' 4X leaders for dry fly fishing and 7.5' 3X leaders for nymphing. We prefer thingamabobber indicators in the 1" size for heavy nymphing and large corkes (5/8") for light nymphing. We use split shot in sizes B, BB, and 3/0. Waders & Boots: Bring breathable waders with a wading belt and felt boots. Spikes are OK. A wading staff can be a big help, too. The Yuba River is open year-round below the Highway 20 bridge. Some of the most popular hatches include the Skwala stonefly, March Brown and PMD mayflies, and summertime terrestrials. Meeting Time & Place: We typically meet our clients at the Browns Valley Chevron at 8am. Vehicle Considerations: There is no shuttle service on the Yuba, so it is necessary to use our client's vehicle to help with the shuttle. Wading difficulty: Wading is fairly easy on the Yuba River. Most wading is done on cobble bottoms. Multiple Fisheries in one Day: We devote an entire day to fishing the Yuba River. Length of the Day: Most full days conclude around 5:30pm.